The player isn't an audience for the comedy of Jazzpunk. The player instigates the laughs. During the first mission in the surreal cyberpunk comedy-adventure game Jazzpunk, the player may run across a frog who is trying to hack into a Starbuck's internet service in order to use the company's WiFi. This “side quest” initiates a mini-game that essentially resembles the arcade classic Frogger, as the player takes on the role of the frog attempting to reach his interface device by hopping skillfully through oncoming traffic. Comedy of various sorts, be it clever one liners or slapstick bits, is nothing new in video games. Tim Schafer has built his company Double Fine Games on his reputation as a successful video game humorist, having created comedic games like Full Throttle, Grim Fandango, Psychonauts, and Brutal Legend. However, what those games did, which frankly most humorous video games do, is build a game with characters who told funny jokes and did funny things in that game, not unlike a comedic movie or a novel that has characters who do likewise. Jazzpunk feels different than Schafer's games. It isn't a game that solely tells jokes in cutscenes and through dialogue. It more often involves the player in the jokes and depends on the player to complete actions necessary to complete those jokes. It is a comedy that hinges on the fact that games are more interactive than other media. The comedy becomes a collaborative act between the game and its player. In an interview, Jess Brouse, one of Jazzpunk's developers, described this kind of approach to comedy, using the metaphor of a jack-in-the-box: “There’s a bit of a jack-in-the-box feel to it, the user of the jack-in-the-box is the one who instigates [the punchline]” (”Necrophone Games on the Making of Jazzpunk”, Virgin Media: The Future of Gaming). The reason that the frog's constant abuse as a figure of slapstick pathos is funny is due to the player's own complicity in abusing the frog. Indeed, the punchline of the joke can be spoiled if the player is especially competent at playing the Frogger clone. If the player succeeds on the first attempt to get the frog across the road, that player will never even be made aware of this gag at the frog's (and at Frogger)'s expense at all. The additional beauty of the comedy of this scene, though, is how familiar this particular “jack-in-the-box experience” is if that player has any familiarity with Frogger. As a game from the arcade era, an era in which games benefited from being excessively difficult in order to cause players to fail and in doing so would additionally cause the player to spend more quarters for the chance to succeed, the idea of a gamer abusing their frog avatar in a video game should be intensely familiar. I played a lot of Frogger in the 1980s, so when that Frogger clone appeared, my expectation was that I was going to get that poor froggy killed a lot. After all, that's Frogger. The fact that my actions and their consequences to the frog became more and more obvious and tangible as he appeared more beaten and bruised with each of my failures was met with a delighted recognition on my part. That my past interactions with Frogger had lacked such visual consequence had me grinning and laughing, as I recognized that the game “knew” who I was as a player, an abuser of video game frogs, who should have seen what horror I had wrought on video game froggies before now. A classic comedic bit revised to work as this kind of “jack-in-the-box” comedy that appears later on in the game further illustrates this idea. 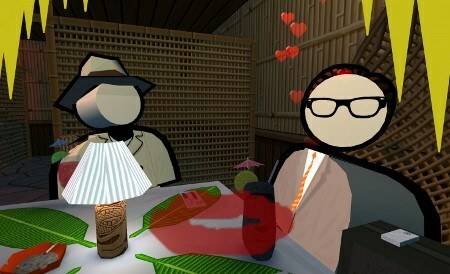 The game's protagonist, a male espionage agent named Polyblank is asked to “gussy” himself up in the guise of a woman in order to switch attache cases with an opposing male spy. Witnessing a straight male's ineptitude at impersonating a woman has been played for laughs throughout cinematic and television history (Some Like It Hot and Bosom Buddies, for instance, immediately come to mind). What makes Jazzpunk's take on it fresh is that the player has to literally enact donning a blonde wig and then applying lipstick by “coloring in” their own lips in an outline on the screen. Since the game is played in first person mode, fringes of blonde hair appear on the edges of the screen after this makeover along with a shadow of less than expertly applied lipstick near where the protagonist's mouth should be. This masculine ineptitude at playing a feminine role is not then something merely witnessed. It is the players own bad coloring job that makes the situation ridiculous and farcical. It is the player's “own fault” that Polyblank looks the fool. Frankly, it is not merely Polyblank that is the fool. It is the players of the game themselves that are the fool in this gag. 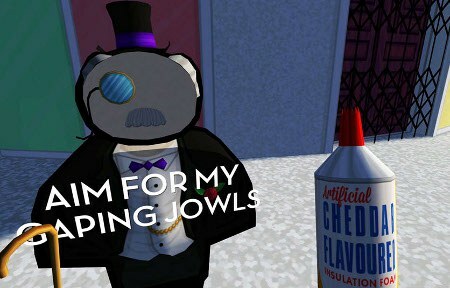 In Jazzpunk, we don't laugh at the clown, so much as we laugh at our own clowning around.